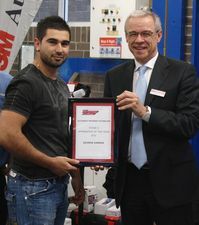 Apprentice spray painter George Karras from Capital S.M.A.R.T at Peakhurst in New South Wales has taken out the New South Wales Apprentice of the Year award for 2012. George was presented with the award by the MTAA and the Apprentice Commission of Australia. Capital S.M.A.R.T Repairs was also recognised by the MTAA and the Apprentice Commission for its "on the job" training programme and support offered to George. Chief Operating Officer Jim Vais congratulated George on his win and for the effort that he put in every day at Peakhurst. "Over the course of the year, George has shown commitment, skill, and willingness to adapt to new processes and has demonstrates a great work ethic." Mr Vais said the award was significant for everyone at Capital S.M.A.R.T. as it not only recognised George for his outstanding performance, it acknowledged the company's commitment to training . "We believe there are other apprentices within our network who are similarly outstanding and focused on delivering on our promise to customers to deliver a high level of service". Mr Vais said it was important to recognise the contribution of the whole Capital S.M.A.R.T team in Sydney, and the partnership with PPG over the past year in supporting the paint team, to make awards like George's possible.